The Sept/Oct fall fashion issue of PUP CULTURE Magazine is your one-stop-shop for everything you need to know about doggie fashion this fall—from the coolest fall clothing combos and can’t miss trends to must have accessories for both dog and owner. Gorgeous fashion features showcase all of fall’s best trends and we get to know Swatch from Mood Fabrics, Project Runway’s canine muse. As always the magazine also includes a great doggie recipe, craft project, fun tips and tricks, our photo editorial, and more. Plus with the launch of our new interactive issue, you will be able to view additional content such as videos, slideshows, and in-issue shopping. 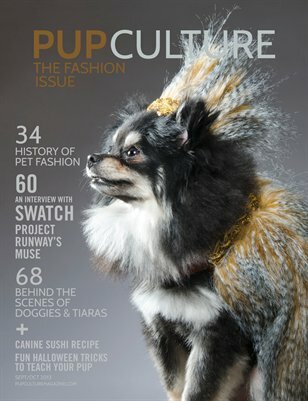 Subscribe or download your interactive issue here http://joom.ag/gvAX to stay informed about all things dog and fashion, or you can purchase a print copy here on MagCloud.